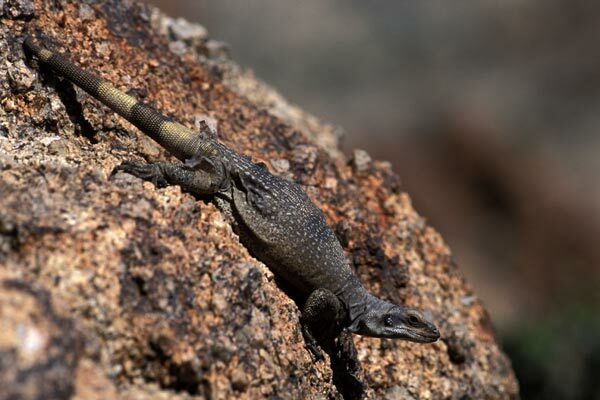 Chuckwallas are large vegetarian lizards that escape their predators by wedging themselves into rock crevices and then puffing themselves up with air so that they can't be pulled out. This one must have thought we were predators because it found a crevice to occupy as soon as we got a few steps nearer. Older reference works used the name Sauromalus obesus for this species. 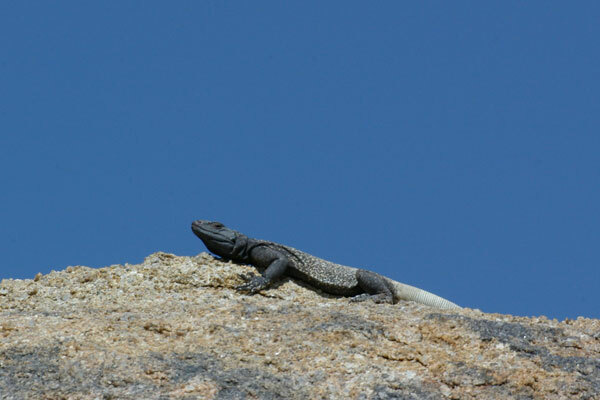 This morning hike was chuckwalla heaven. Chuckwallas like to be nice and warm before they clamber about chomping on desert vegetation, so they spend mornings basking in the sun. We must have timed our hike just perfectly: chuckwallas were everywhere (we counted 36), and many of them were not yet sufficiently warm to run off when we got near. The first one pictured above is a youngster; the second one is an adult female. Youngsters and adult females are distinguished mainly by size. They both have solid tan bodies and banded tails. 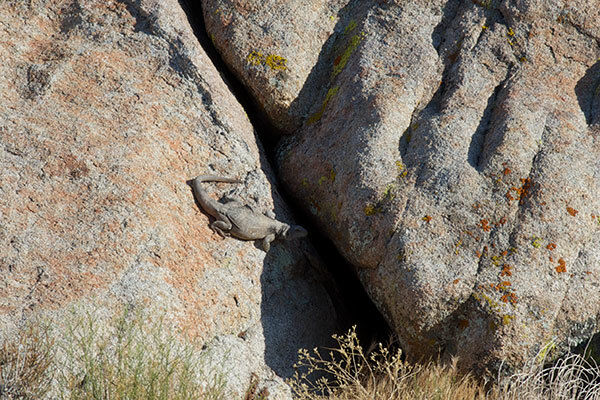 The first of the two males above has seen me draw near and has flattened his body against the rock. He would probably have dashed into a crevice had I gotten any closer. The second of the two males above was not so shy. I kept getting closer and closer without him moving. Finally I grabbed him and admired his leathery skin and sharp sharp nails for a few minutes before releasing him back to his rock. That was enough to wake him up properly -- he raced a few feet away and gave me a dirty look until I left. 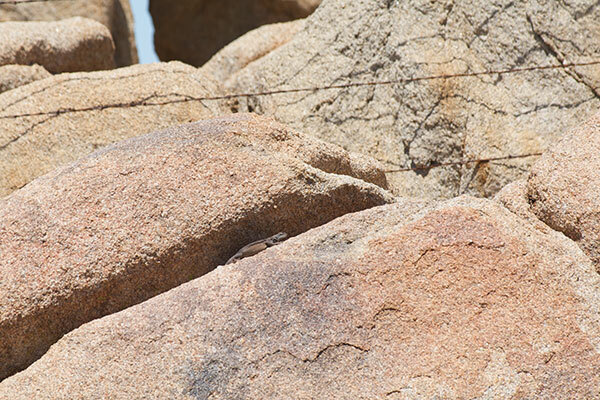 My wife, our four dogs, and I stopped for an hour or so at Alabama Hills while heading up U.S. 395 so I could do a little lizard photography. 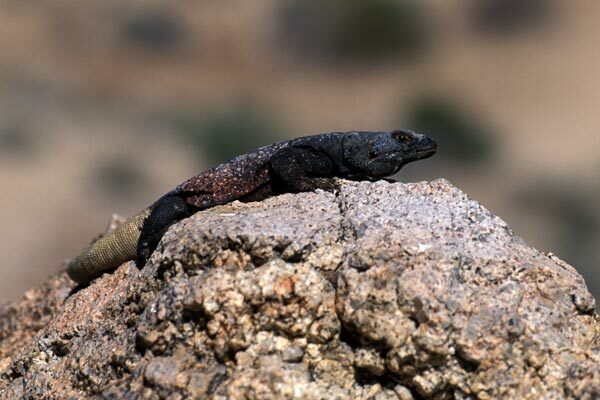 The finest lizard of the hour was this wary chuckwalla. 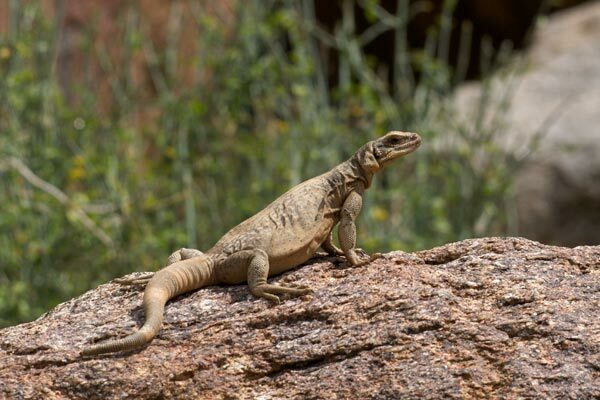 Chuckwallas are among the largest lizards in the U.S., probably second only to Gila monsters among native lizards. I think they indisputably have the most entertaining name of any American lizard though. 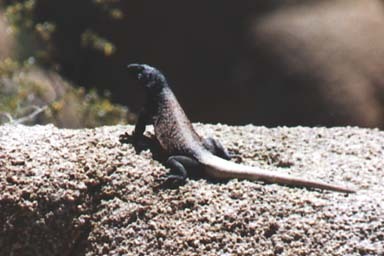 "Chuckwalla". Try saying it ten times quickly. It's just funny. 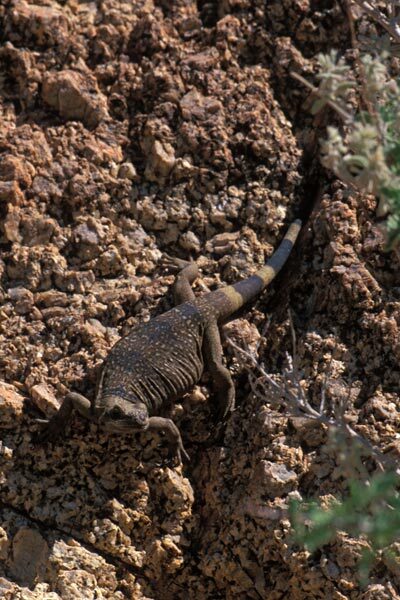 Low temperatures and strong winds kept the lizard count low on this day in the desert. 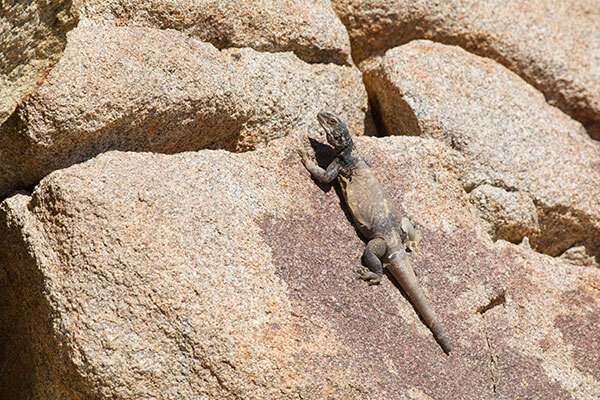 All we could manage chuckwalla-wise was this distant fellow on his way into a shadowy crack in the rocks. On my next visit to this area, a cold spell once again kept the interesting lizards out of sight for much of the morning. I hiked around for the first couple of hours seeing nothing but the occasional side-blotched lizard and whiptail. 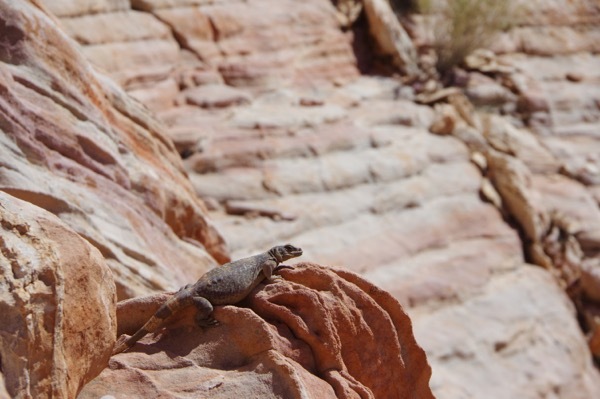 But around lunchtime it had warmed up enough that the banded rock lizards had begun basking and clambering about, and then the chuckwallas started to emerge. 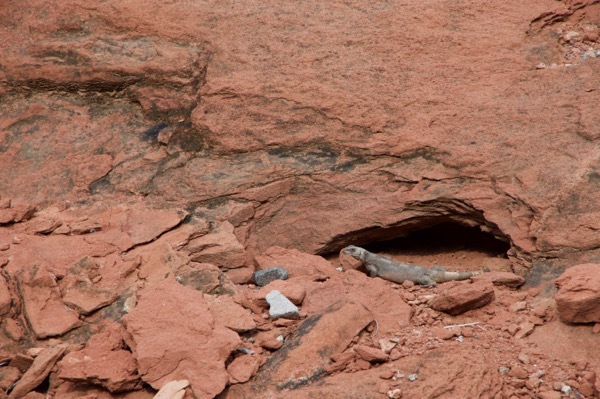 This first one I saw was ready to dive back into its granite crevice at the slightest provocation, and did so when I got a few steps closer than this. The next one I saw was feeling a little braver, perhaps because it had warmed up enough that it felt more confident in its ability to scramble a few feet before a predator could reach it. I snuck up slowly and got reasonably close before it made its inevitable move. We saw several chuckwallas attractively posing in beautiful rock formations while walking the dogs in SARA park's trails, but none of them would let me get very close. 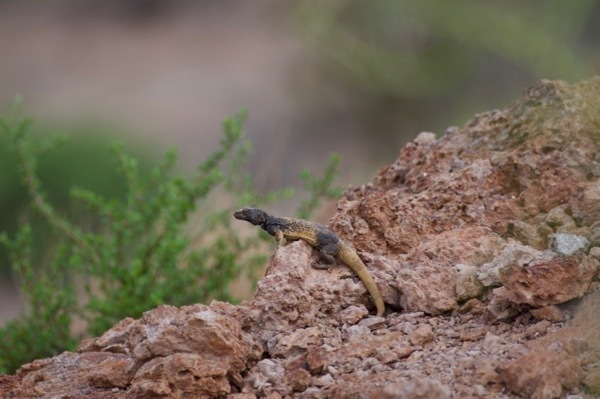 I'm a sucker for a chuckwalla posing against a red rock background. 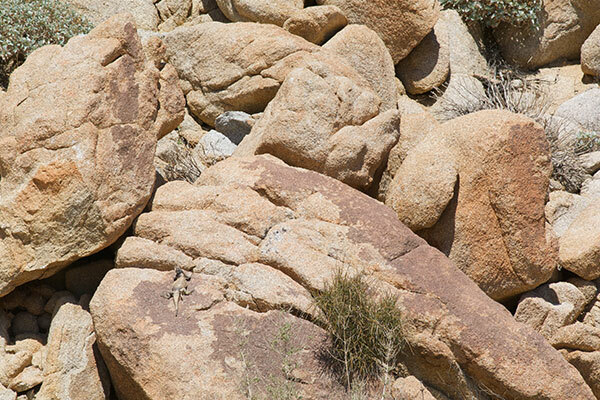 We were out looking for lizard shapes on roadside rock outcrops, hoping to find a brilliant blue Dickerson's Collared Lizard. 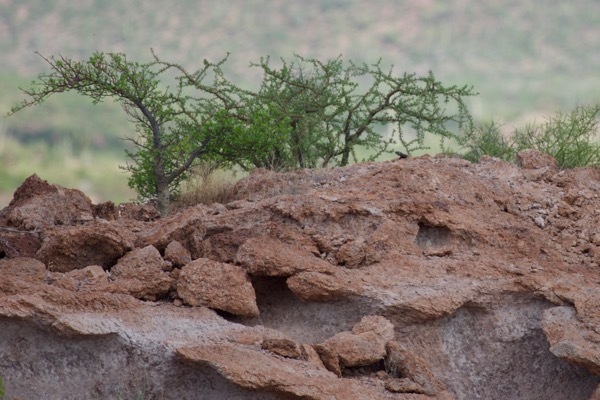 We had a moment of excitement when we spotted this distant lizard silhouetted against the late afternoon desert sky. 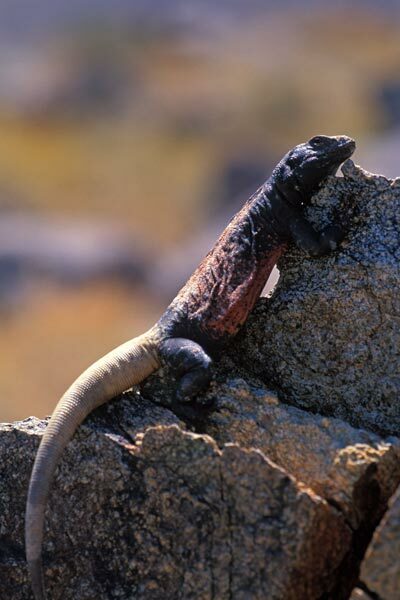 It turned out to be no blue collared lizard, but, still, everyone loves a chuckwalla.